The Great Supper, typical Christmas Eve supper, the most important one in Provence. 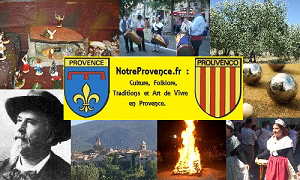 The Great supper, “gros soupa” in Provencal, is a typical Christmas Eve supper, the most important one in Provence. The table is set on three white table clothes spread one over the other as a reminder of the Holy trinity, the Father, the Son and the Holy Spirit. A chandelier with three candles lights the table symbolizing times: the Past in remembrance of the recently deceased ones, the Present as a token of faith to friends and parents and the Future in expectation of the children to come. The three Saint Barbara's Wheat cups are also on display both as a reminder of the Holy trinity again and as a show of hope as well. Indeed the finest table ware is displayed. The Great Supper is served after the “Cacho-Fio” and before Midnight Mass. Paradoxically the Great Supper consists in seven light meatless dishes as a reminder of the seven pains of Virgin Mary. Although it hints at a hearty meal it certainly was so in the past as compared to the ordinary meal of the rest of the year. It turns out to be a light meal by the simplicity of the dishes and a hearty one by their number. This meal is loaded with symbols and constitutes a main part of Christmas Eve. The symbolism of numbers is not due to coincidence: 3 represents the Holy Trinity, 7 represents the seven pains of Mary and the 13 desserts Christ and the 12 Apostles. These meatless dishes are generally made of vegetables and other goods available at home; therefore there is a certain disparity in them depending on the region. Nevertheless some traditional vegetables must be present when setting the table such as cardoon, celery, artichoke, etc. with anchovy puree as dressing. This Great Supper usually included another light dish. Here is a typical Great Supper menu: cabbage soup, celery with anchovy puree, vegetable soup, cod fish with spinach gratin, cardoons. The meal finishes with the thirteen desserts served in abundance. In accordance with tradition all dishes must be set on the table at the beginning of the meal including the 13 desserts. Another custom requires that the table be laid with an extra set of cutlery should an unexpected guest show up. Finally, it customary not to clear the table but simply fold the corners of the tablecloth onto it so as to allow the souls of the dead and small angels to have something to eat !